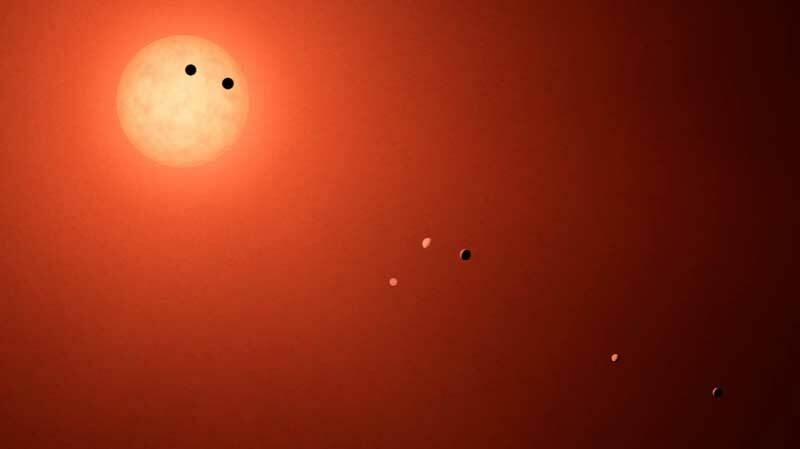 On Feb. 22, astronomers announced that the ultra-cool dwarf star, TRAPPIST-1, hosts a total of seven Earth-size planets that are likely rocky, a discovery made by NASA's Spitzer Space Telescope in combination with ground-based telescopes. NASA's planet-hunting Kepler space telescope also has been observing this star since December 2016. Today these additional data about TRAPPIST-1 from Kepler are available to the scientific community. "Scientists and enthusiasts around the world are invested in learning everything they can about these Earth-size worlds," said Geert Barentsen, K2 research scientist at NASA's Ames Research Center at Moffett Field, California. "Providing the K2 raw data as quickly as possible was a priority to give investigators an early look so they could best define their follow-up research plans. We're thrilled that this will also allow the public to witness the process of discovery. During the period of Dec. 15, 2016 to March 4, the Kepler spacecraft, operating as the K2 mission, collected data on the star's minuscule changes in brightness due to transiting planets. These additional observations are expected to allow astronomers to refine the previous measurements of six planets, pin down the orbital period and mass of the seventh and farthest planet, TRAPPIST-1h, and learn more about the magnetic activity of the host star." The release of the raw, uncalibrated data collected will aid astronomers in preparing proposals due this month to use telescopes on Earth next winter to further investigate TRAPPIST-1. By late May, the routine processing of the data will be completed and the fully calibrated data will be made available at the public archive. The observation period, known as K2 Campaign 12, provides 74 days of monitoring. This is the longest, nearly continuous set of observations of TRAPPIST-1 yet, and provides researchers with an opportunity to further study the gravitational interaction between the seven planets, and search for planets that may remain undiscovered in the system. TRAPPIST-1 wasn't always on the radar to study. In fact, the initial coordinates for the patch of sky defined as Campaign 12 were set in Oct. 2015. That was before the planets orbiting TRAPPIST-1 were known to exist, so Kepler would have just missed the region of space that is home to this newfound star system of interest. But in May 2016, when the discovery of three of TRAPPIST-1's planets was first announced, the teams at NASA and Ball Aerospace quickly reworked the calculations and rewrote and tested the commands that would be programmed into the spacecraft's operating system to make a slight pointing adjustment for Campaign 12. By Oct. 2016, Kepler was ready and waiting to begin the study of our intriguing neighbor in the constellation Aquarius. "We were lucky that the K2 mission was able to observe TRAPPIST-1. The observing field for Campaign 12 was set when the discovery of the first planets orbiting TRAPPIST-1 was announced, and the science community had already submitted proposals for specific targets of interest in that field," said Michael Haas, science office director for the Kepler and K2 missions at Ames. "The unexpected opportunity to further study the TRAPPIST-1 system was quickly recognized and the agility of the K2 team and science community prevailed once again." The added refinements to the previous measurements of the known planets and any additional planets that may be discovered in the K2 data will help astronomers plan for follow-up studies of the neighboring TRAPPIST-1 worlds using NASA's upcoming James Webb Space Telescope. During Campaign 12, a cosmic ray event reset the spacecraft's onboard software causing a five-day break in science data collection. The benign event is the fourth occurrence of cosmic ray susceptibility since launch in March 2009. The spacecraft remains healthy and is operating nominally. NASA: "The Rosetta Stone for Super-Earths?"